I was in an interview and haven’t heard back from the company for two weeks. Can I call them or what should I do? Again, this is a very typical question that I hear from candidates I’ve met with that are or have been in process for being considered for a position they have applied to directly themselves or with some “agency” style recruiter. My answer to this is a simple one – absolutely call the person you were last meeting with. When you reach them simply say you are calling to follow-up on your interview (state when that was) and want to find out what are the next steps. However, before you find yourself in this position “wondering what happened two weeks after your last interview” with a particular company, I would suggest that you take a couple steps during that interview that should hopefully give you a better position & standing. At the end of each interview you should always be sure to express your interest in the position, even going so far as to directly say that you believe this is the position for you and you are very interested in the company and being part of their team. Secondly, you should always be clear as to what are the expected next steps. Directly ask the interviewer, after you have expressed your interest in the position, “what are the next steps?” This not only again expresses your interest in this position, but also gives you a clearer idea as to what you can expect to happen and when. Of course it can and does happen, that even though you received the information as to what are the next steps, this has somehow been altered or missed in some way. So, the follow-up call with them (if there is some delay in what they said would be happening and the current situation) will be your chance again to let the company know that you are very interested in this position and clarify the situation. I will wrap this up by saying that this situation is different when you are dealing with a Headhunter. 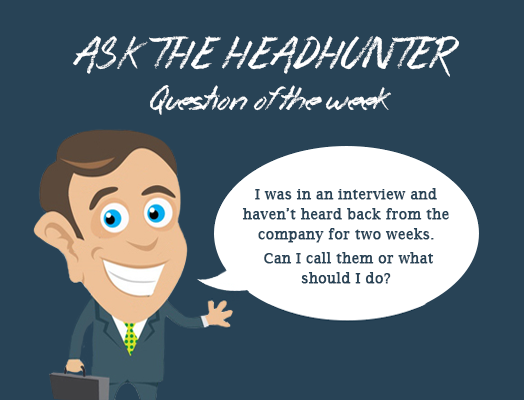 Your Headhunter will always be a great direct line of communication with the company they have presented you to. So if there is ever a “question” as to what is happening, again don’t be afraid to pick up that phone to call the consultant and ask. But if all is working normally, it will likely be the Headhunter calling you first to let you know about the delay before there is one and informing you what has to be done next. If you you have anything in mind that you would like to ask from GRN Czech’s professionals or if you would like to give us some feedback regarding our social media pages, don’t hesitate to leave your reply below the article or send it here! This entry was posted in Career Coaching and tagged career coaching, follow -up, headhunter, interview. Bookmark the permalink.